Cal here again. Tonight I’d like to continue discussing Fenton Dolphin stretch glass. 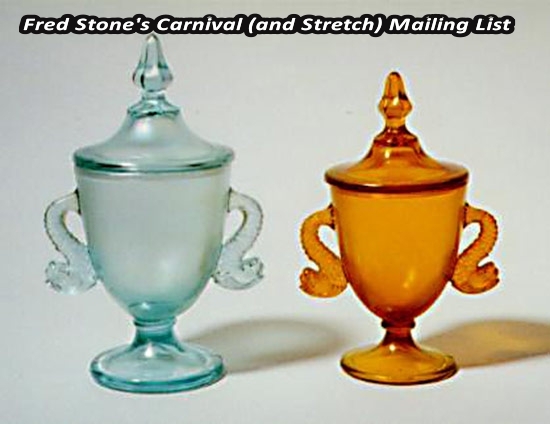 A few weeks ago we looked at the range of colors which Fenton used to make their vintage, dolphin line, stretch glass. 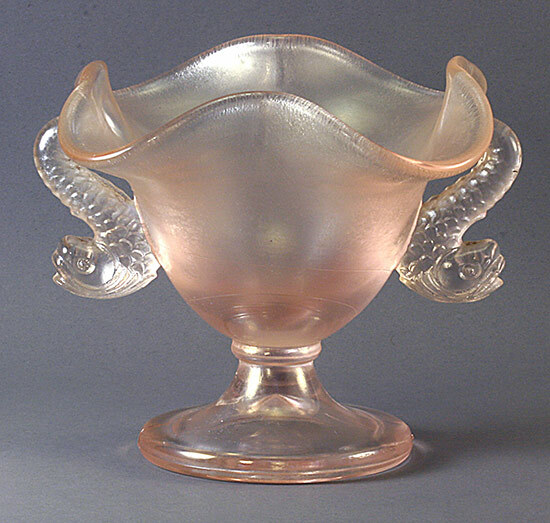 Let’s now look at the variety of shapes in which vintage Fenton dolphin stretch glass is known. 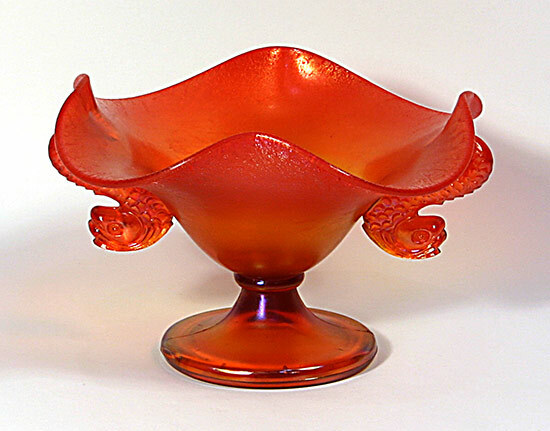 I need to mention that Fenton produced dolphin stretch glass during both the vintage period (1916-1932) and the contemporary period (1994-2010). I do not believe there are any exact re-issues (same color, shape & size) but there are similarities between the pieces from the two periods and you should know whether you are acquiring a vintage or contemporary piece because there are significant differences in value. I’m going to concentrate tonight on vintage dolphins; we will discuss contemporary dolphins later. 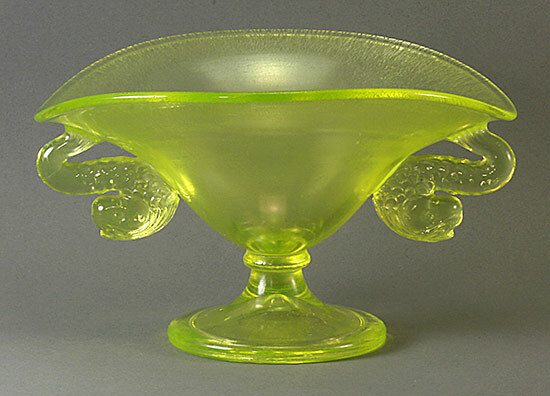 We are aware of bowls, candy jars, candleholders, center-handled trays, comports and fan vases. 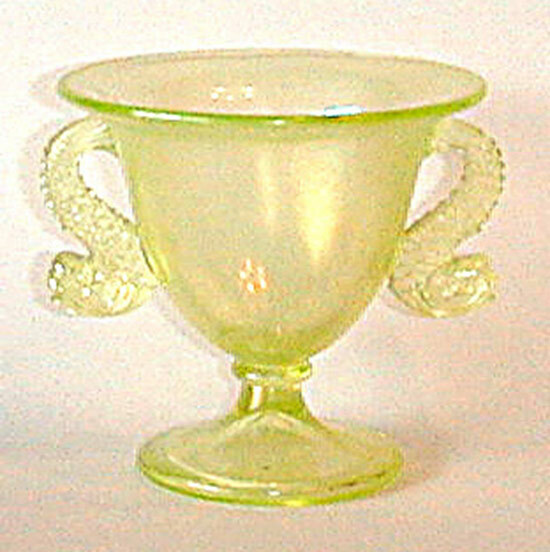 In all cases except the candleholders, the items were made in various shapes and sizes and in some cases they are available both with and without the addition of the diamond optic design. There is also a spiral optic bowl known! Bowls are available in a triple-dolphin form with a snap foot (fairly obtainable), a small twin-dolphin form with a ground foot (very uncommon), and a very large, twin-dolphin “footed bowl” which most would identify as a comport today. Tonight I’ll focus on the candy jars and the comports and fan vases made from the same moulds. Fenton made two sizes of twin-dolphin candy jars. 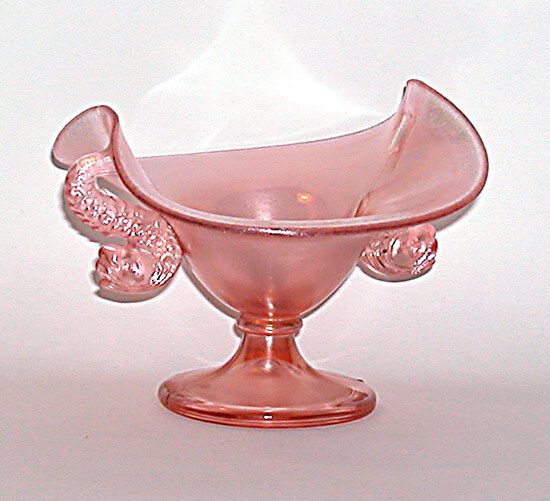 Comports and fan vases were made from the same molds as the candy jar bottoms. The most reliable measurement for distinguishing between the two sizes of these items is the diameter of the base; the smaller ones have a base diameter of 3” while the base of the larger ones is 3 ½” in diameter. The overall sizes are noticeably different as well, but because of the “stretching” of the glass, the overall widths and heights will vary somewhat. While these similar items were produced using the same molds, they end up in very different shapes as you can see from the photos. 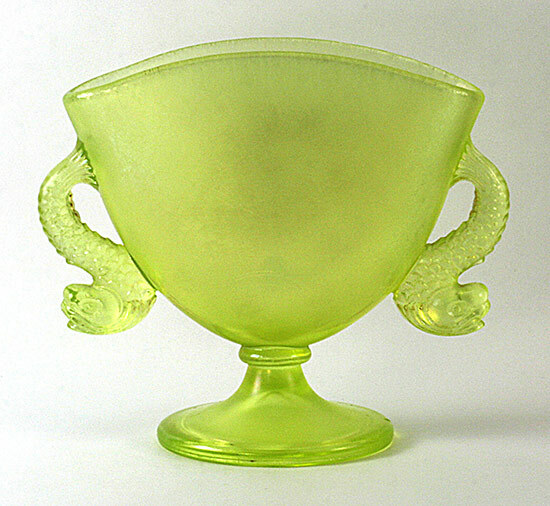 Fan vases and the associated comports are sometimes found with a diamond optic treatment; these are much more rare than those without the diamond optic treatment and are highly desired by collectors. 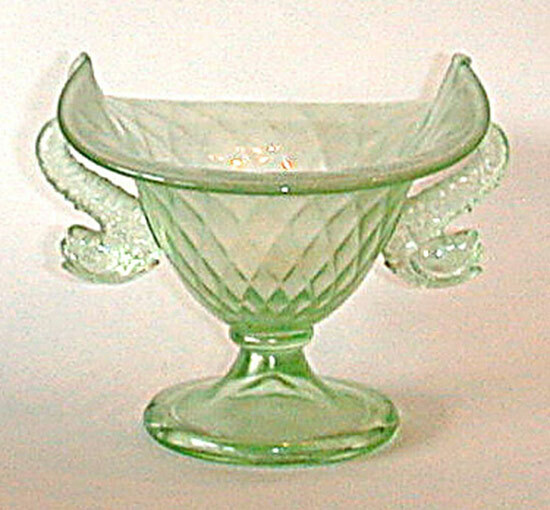 Comports are known in round flared, oval, square and a few more unusual shapes. The square top is the more common, followed by the oval ones. Those which are simply round and flared or ended up in other shapes are harder to find. There are some with tops which appear to be unique and are likely whimsies. Comports are known in 2 sizes and in Aquamarine, Florentine Green, Persian Pearl (rare), Ruby (rare), Tangerine, Topaz and Velva Rose. As with candy jars and fan vases, not all are equally available in all colors in both sizes. Any with the Diamond Optic treatment are scarce or rare. Fan Vases are known in 2 sizes and in Aquamarine, Celeste Blue (rare), Florentine Green, Persian Pearl (rare), Tangerine, Topaz and Velva Rose. Any with the Diamond Optic treatment are scarce or rare. 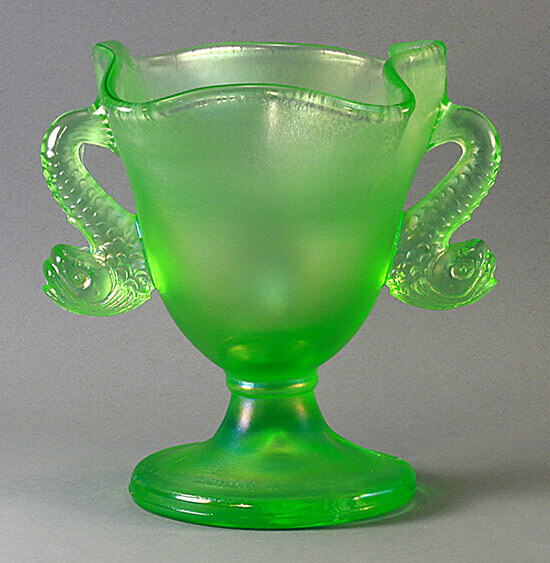 Next time we will take a look at some other stretch glass items made by Fenton which incorporate dolphins. In the meantime, we look forward to seeing the dolphin stretch glass you have and possibly discovering a new item of which we are not currently aware. Thanks for sharing.